Jackie Fisher and Bryan Duffy met in downtown Las Vegas in 2008 but never imagined they would plant roots in the heart of the iconic city nearly a decade later. 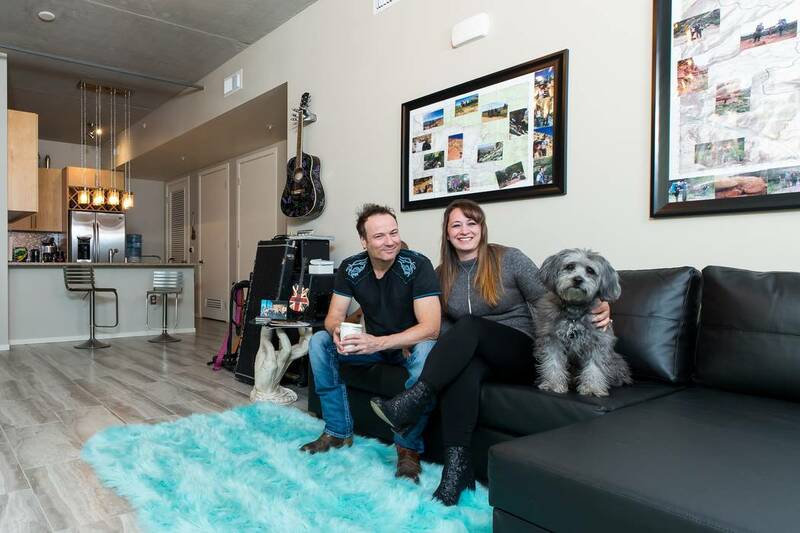 “We bought a single-family home in Summerlin in 2012 and loved everything about it,” Fisher said. “But a few years ago, we realized we weren’t living the lifestyle we wanted. Thanks to Juhl’s one-of-a-kind floor plans, which include more than 130 different layouts, Fisher and Duffy created their own space, choosing flooring, backsplash, paint and closet configurations. They received an early Christmas gift when they closed on their home in mid-December. Fisher and Duffy shared their appreciation for the concierge team who knows residents’ names by heart, greeting them as they come, reminiscent of longtime neighbors and friends. They also enjoy The Promenade on the ground floor of Juhl, a stretch of craft retail offerings, which includes one of their favorite hot spots, the Classic Jewel. The couple frequents area attractions, including Eclipse Theaters, the Arts District and nearby restaurants such as Le Thai, VegeNation and Eat. And, with Duffy’s band performing regularly in downtown, he is usually within minutes of his next gig. “We enjoy the walkability to great dining, entertainment and shopping, and it makes us feel like we are constantly on vacation. Ten years ago, downtown Las Vegas didn’t look like it does today, and we are thrilled to see firsthand the area’s ongoing revitalization. And, while our schedule hasn’t allowed us to participate in most of the community events led by Evelyn Connors, Juhl’s lifestyle director, we look forward to attending comedy and open mic nights,” Fisher said. Juhl includes dozens of floor plans that are one of a kind, with studios starting in the low $200,000s. Recently remodeled, Juhl boasts an upgraded resort-style pool with cabanas, lobby and co-op working spaces that cater to its professional residents. Private balconies, 10-foot ceilings, energy-efficient design and details, exposed concrete surfaces and mechanicals and upgraded fixtures and surfaces all combine to create Juhl’s cool urban vibe.